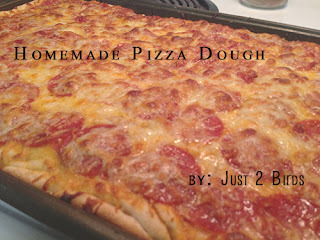 Just 2 Birds: Homemade Pizza! Today was a LAZY day! I think I stayed in bad all day. Between working on Sara's blog and thinking about how much I don't want to go back to school and the impending finals I was glued to that bed! Michael was sweet enough to wait on me all day bringing me the best hot cocoa ever, taking care of the dog, and giving me a great back rub! How did I get so lucky?? He came and laid in bed with me to watch Parks and Recreation, Modern Family and even indulged me on The Vampire Diaries! When 6:00 finally rolled around I decided I should probably get up and make that sweet man some dinner. I looked up a good recipe for pizza dough and realized I was a little short on flour so we had to come up with our own variation. Dissolve the yeast in the water. Add the rest of the ingredients in and mix. Dump onto a floured surface. Knead into a smooth dough (five minutes or so). Roll out and press down onto a greased pizza pan. Add toppings. Bake at 450 degrees F. for around 12-15 minutes until the crust looks crispy and lightly browned. *Note- you can also make double or triple of the recipe, freeze it, and then pull it out in the morning to thaw in the fridge for an evening meal. Even simpler! Try this one out! It's so good and I loved that we got to add some wheat flour for a bit of a healthier twist! Like it much. Hope I can make my homemade pizza too. Thanks. Made this, was delicious and might one of the best homemade pizzas I made! The crust was YUMMY!